©2008 - I originated all the written below - usage by permission only! I particularly enjoyed to used this unit in combination with a sequenced synth bass: the unit added an amazing richness to the bass plus it's vintage analog electronic drum sounds! It shall also be mentuioned that this unit was manufactured by Gibson, Kalamanzoo, Michigan to the highest quality standards: The box is heavey alluminum with full boddied alluminum knobs with an embossed metal logo (shown) and comes with it's own custom made samsonite-like suitcase - the suitcase has another alluminum inlay, which was printed in color with the Maestro Logo! The suit case has latches, and has locks hold th elid open! Detailled Description: More technical detail. The Filter Section: (Yellow on the unit): The incoming signal is sent to 3 tone filters ("Color Tones" 1, 2, 3 - very nice sound!). Each filters output can be added to the output with a rocker switch (white switches). There is also a rocker that allows to add the "clean" original signal to the mix (rocker switch is yellow) There is a knob that allows to controll the overall volume of the filter section and another tone control knob. The Bass Section: (Blue on the unit): The incoming signal is amplified then sent to a frequency divider, which generates a sub harmonic bass signal whose frequency directly relates to the incoming signal. here we find 2 rocker switches (blue): String Bass and Fuzz Bass - Very original sound! Each of the bass signal sounds different and I believe one has a somewhat different attack envelope as well. The knobs in the bass section (blue) allow to control the colume of the bass and sustain (for the string bass - I beleive). Rhis text requires permission to use it! OVERALL (Maestro G-1 - Detailled Description continued): There is a sensitivity knob which controls the trigger point for bass and drums. There is one footswitch input (original footswitch included with the unit!) This allows to mute the bass and rhythm sections. There is a cancel button that resets any switch selections. There are 1/4" in and outptuts (one each) and a backlight power switch. Features: (left to right, top to bottom): 1/4" output jack, Footswitch jack: Bass+Percussion, Row of knobs: PERCUSSION: Volume, Tone, BASS: Volume, Sustain, TREBBLE: Volume, Tone; Cancel switch, Power switch, 1/4" Input, input sensitivity control, Row of rocker switches: Bass Drum, Bongo, Brush, Tambourine, Clave, String Bass, Fuzz Bass, Color Tones 1, Color Tones 2, Color Tones 3, Natural Amp; Color printed Maestro Logo. Lot: 1 1968 Vintage Gibson Maestro G1 Rhythm 'N Sound, 1 original Maestro G1 suitcase, 1 original Maestro G1 footswitch, 1 copy of th eschematic for this unit, 1 copy of a written description of this unit. Condition: Overal physical condition: excellent with few signs of use, very clean! It appears that th eunit has been kept in it's suitcase for most of it's life! Electronic condition: This unit should work trouble free for years, as it had been completely reworked which included to replace all electrolytic capacitors in the signal path. Work performed to restore this unit: Deoxydized, cleaned and lubricated all controlls, switches and contacts, plus the inner parts of the foot switch; re-soldered all recognizable aged solder points, replaced all electrolytic capacitors in the signal path. Full fucntional test. Physical cleanign and detail work. Description: Here the original Mutron III battery version - battery power is cleaner than AC power! 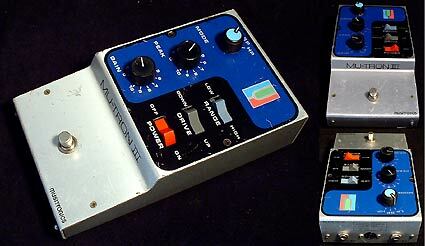 This unit has the gold plated American made vintage original photo modulator (untouched). This unit (except for the top knob) is in original, but fully reutbished condition. I know it is tempting to upgrade the unit with modern components and do some mods, but I left the circuit completely alone. However I did deoxydize all controlls, jacks, switches and the battery terminals. I also replaced the 3 electrolytic capacitors with fresh ones (original parts pulled included in a bag) So: this unit is as original, bu talso as fresh as you may find it, and in nice reliably workng condition! For those of you not familiar wiht the Mutron III: It is a compact foot pedal envelpe follower filter type effects pedal designed for guitar and bass that offers a large variety of filter modulation typ of sounds that remind of vintage analog synths. Needless to say that it is a classic used by great many bands, including: Jerry Garcia and Stevie Wonder. Get original vintage sound and not retro! Condition: Physical: Good leaning towards fair: scratches, dings, Door of battery compartment has partially peeled off paint at the bottom, part of the original battery compartment label missing, other thna that: Clean and bright (unit shown in above picture! ), but has some scratches, working condition: prefect - recently ovehauled. Work performed to restore this unit: Deoxydized, cleaned and lubricated all controlls, switches and contacts, plus the inner parts of the foot switch and battery contacts; re-soldered all aged solder points, replaced the 3 main electrolytic capacitors. Repaired the filter selection switch. Installe dth emissing filter selction knob. Full fucntional test. Physical cleaning and detail work. Dimensions: W: 5" H: 3" D: 8.5"
Price: $ 399.00 SOLD! as described above. Mods or upgrades can be performed at additional cost, but the point here was to leave all original. Also can custom build an AC power supply that will work with this unit. I bought this unit in the late eighties. Then it looked like the tiny photo in the top part of above image. I got really anoyed and tired of it's impractical design: It's inputs were in the front, the controls were on the top and the foot pedal and the outputs connected in the back. Where ever I moved it to, it quite did not fit into my studio as ti was and so I decided to finally rack mount it in 1995: all controls up front, all connectors in back! As this is a major project, I decided while at it to bring out the best in this machine: there already was a control pin in th efoot pedal jack to control manual modulation for the specialty acessor foot pedal. I decided on the following improvements: I needed a foot pedal input that would hook up a standard foot pedal, such as the one used for a Yamaha DX-7, I wanted a CV input (analogue synth control voltage input) and I wanted to have it easy while hooking the unit into my mixer: I wanted one insert plug to be easily moved at whatever chanel it was needed. Now: These are the resulting extra features I added: 1/4" input to hook up a foot pedal, 1/4" jack for CV input (0-5V), CV / Pedal switch on the front panel to select the two inputs; Insert type patch cable input: 1/4" jacks for the input and output of the audio signal, where the top jack is a stereo jack which allows to use a stereo cable to plug into the insert jack (the top jack carries input and output if only the top jackis used. When the bottom jack is used in switched over to just be an input - EASY HOOKUP!). I also greatly refined the gounding scheme of this unit by star grounding and by pulling signal ground off the chasis ground (much cleaner signal!). Imoved the power transformer and the power supply as far away as possible form the audio PCB (in the original unit it is right underneath it1). I also added a dual position power switch, which allows to reverse the AC line. All elese is original. I might have put IC sockets in for the op amps and upgraded them to lower noise types. I will have to look. All else is original. Features: (left to right. top to bottom and front to back): FRONT - TOP ROW: LFO rate of LFO A, Modulation of Phaser-A by external source or by LFO (switch), LFO-A rate controlled externally (foot pedal or CV) or internally by rate knob A, LFO-A waveform: square, triangle (switch), LFO-B rate knob, External input selector: CV or Pedal (switch), Phaser B controlinverted or normal (switch), LFO-B waveform: sqaure or triangle, modulation source selector knob for Phaser-B: by LFO-A, by LFO-B or by external control inputs (3 step rotary switch); FRONT BOTTOM ROW: <modulation> Depth of Phaser-A (knob), Feed back control of Phaser-A (knob), <modulation> Depth of Phaser-B (knob), Feed back control of Phaser-B (knob), Audio input source selector for Phaser-B: Input-A, Output-A Input-B; There are Bi-Colored LED's already mounted, intended for the indication of the LFO frequency and phase, but thatcircuit I never implemented. I can supply th edrawign to do it yourself. It involves one or two dual op-amps (1458) and a few resistors. I hope this illustrates how it works and what can be done with it.  Rack Mount Casing with all controls on the front and all connection jacks in the back..
 External control input slector in front panel.  Transformer to audio PCB distance improved.  All else is original. Condition: Good to Excellent, works perfectly. Lot: 1 Mutron Biphase modified to rackmount casing with additional modifications that add features, but leave all the audio circuitry original; The original Mutorn bypass foot pedal. I will also include a Xerox of all drawigns completed when modifying this unit. HOWEVER: If having a budget of aproximately $ 1100, I can custom build a similar unit for you. 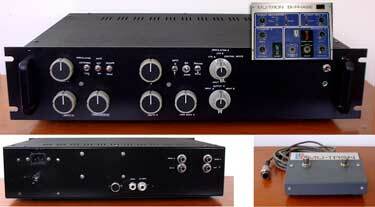 Description: This unit is labelled as "Stereo Reverb System", but is actually a delay and not a reverb! There are vintage analog ICs that generate the effect, which are Bucket Brigade Delay ICs, the set of (oscillaor and delay IC): MN 3007 and MN3101. If not for using this unit as an analog delay: it might even come in handy to use the fully working bucket brigade ICs of thsi unit to repair other more famous units that use the same ICS. This unit works and sounds great and features the following control elements: Delay signal intensity, feedback (depth) and delay time (delay). The unit takes stereo line input signals and provides a mono Mic input. As this unit was originally desinged to add reverberation to a Hi-Fi stereo system by inserting through the tape monitor loop, there are 2 sets of connectors at the back of this unit: the 4 RCA jacks to hook inot the tape monitor circuit of an amplifier and another 4 RCA jacks to hook the tape deck up to this unit. There are switches that allow the signal flow to generate a delayed signal. This unit can also be used in conjunction with a mixing console. Great sound, the real vintage deal! From robot sounds ot filter effects to delay effects. FEATURES: (front Pannel L to R): 1/4" Mic input with internal Mic pre-amp, Control elements: switches for Tape monitor, Reverb record; Controls for: Mic Mixing, Depth (delay amount), Delay (Delay Tme), Switches for: reverb Expand, Power. FUNCTIONS: Originally desinged to be looped into the tape monitor circuit of a Hi-Fi system. Allows to mix a 1/4 Mic input (with Mic pre-amp) into the stereo signal. Expand function creates an expanded stereo image of the delay. If no line signal fed: Input via 1/4" Mic input and outptu via RCA jacks. Condition: Excellent condition. A few signes of use, otherwise clean. Works perfectly - 100%!. Lot: 1 Realistic Stereo Reverb System No 42-2108.